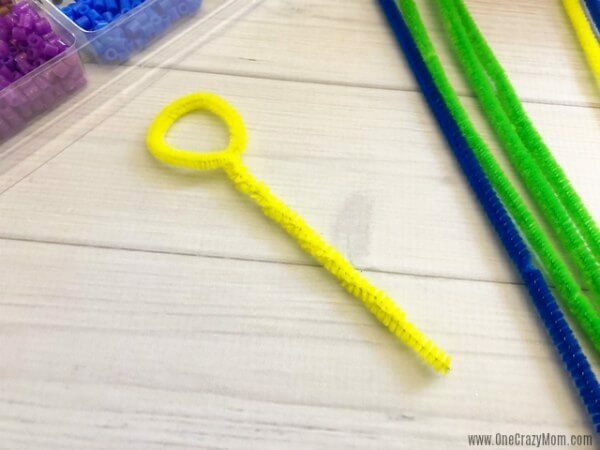 The kids will love this DIY Bubble Wand. These are so colorful and fun. Plus, they are simple to make. If you are looking for a fun activity with the kids, look no further! This DIY Bubble Wand is a blast to make. Let the kids choose the colors of the wand. Plus, they get to decorate it with beads too! After they are finished, it’s time to blow bubbles! This activity is just so much fun. It’s a great way to keep the kiddos busy without busting the budget. Everyone loves bubbles! How do you make the best bubble solution? Homemade Bubble Wands are a blast to make! You can even make this easy homemade bubbles solution! This solution is so easy to make and the best bubble solution we have made. This bubble recipe is amazing and so cheap to make! You can make big bubbles with dish soap! This activity is fun and inexpensive. 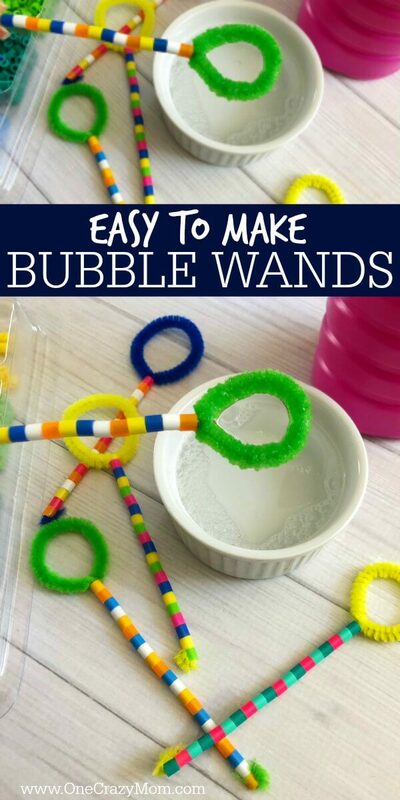 Keep reading to find out just how simple it is to make a bubble wand. You will be blowing bubbles in no time at all. This is such a cool DIY activity. Let’s get started making these diy wire bubble wands! 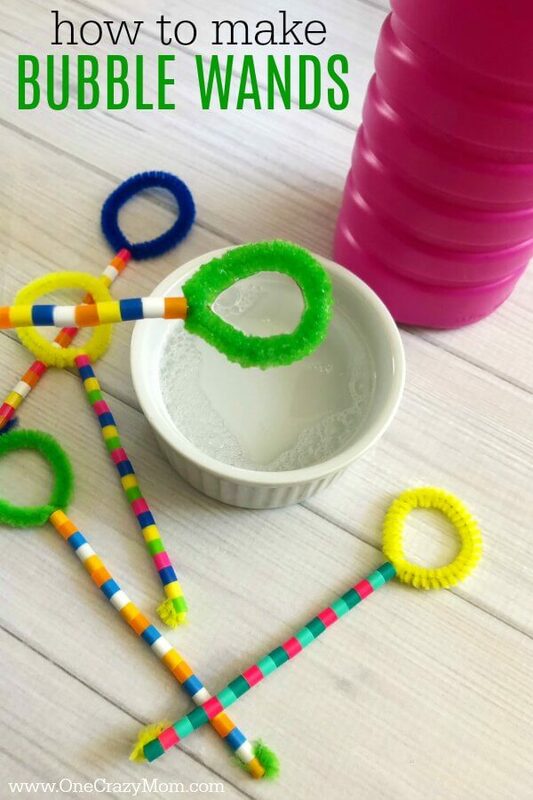 The kids will love this learning how to make a DIY bubble wand. 1. 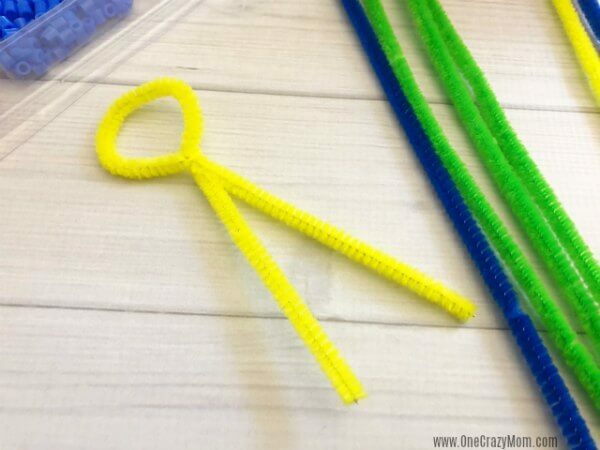 Place the two ends of a pipe cleaner together and twist the bottoms together, leaving the top in a circle shape. 2. Start placing beads onto the bottom two pipe cleaner ends and pushing them to the top. You can create any color pattern you would like. 3. 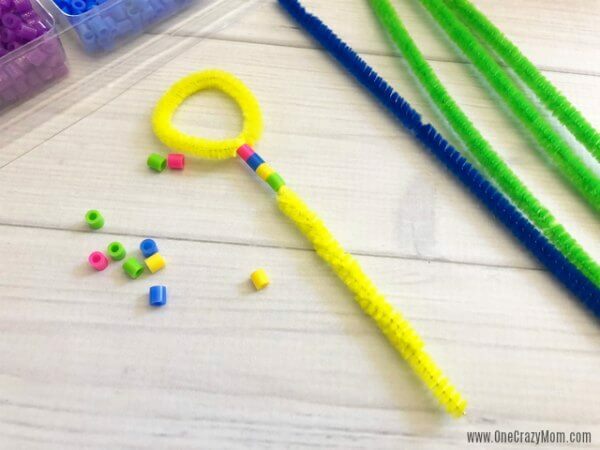 Once you fill the wand with beads, fold the end of the pipe cleaner up to hold the beads in place. 4. Fill up a small dish with bubbles and dip the circle end of the wand into the bubbles. Blow on the wand to make bubbles. 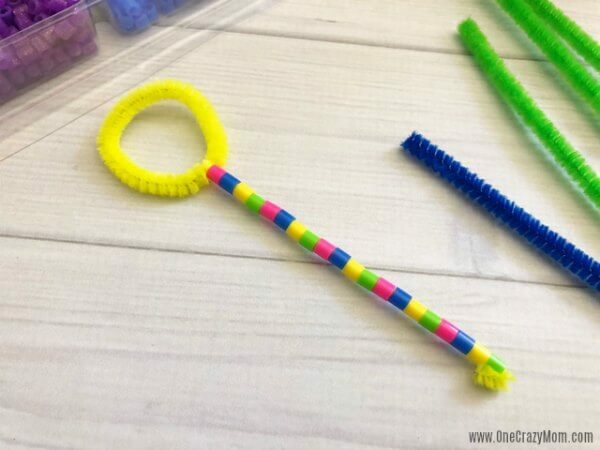 Try making this fun Tri String Bubble Wand! 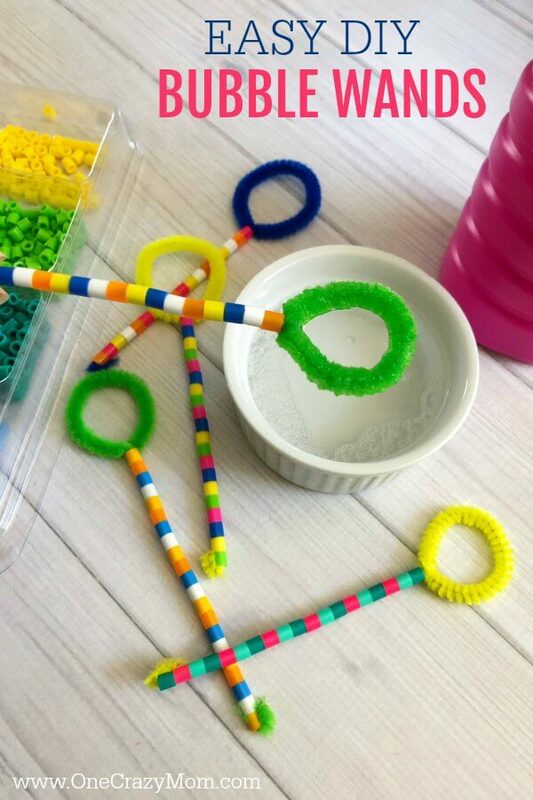 Everyone will love making their very own bubble wand. This project is great for little ones and also older children. 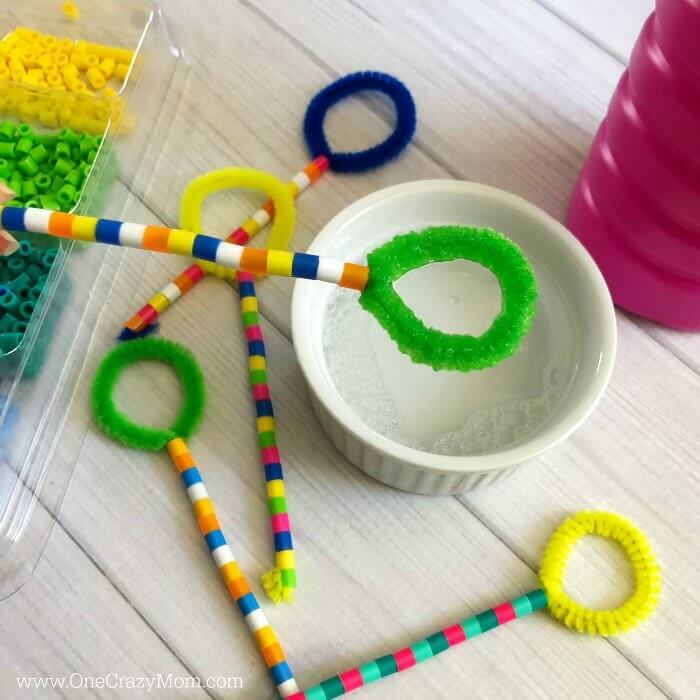 Kids of all ages love bubbles plus it’s fun to make and decorate your own bubble wand. You will enjoy seeing how each wand turns out. The colors each child chooses. Their creativity comes alive! It’s part of the fun to see how each wand turns out. This activity is SO much fun! The entire family will love learning how to make bubble wands. You can also make a coat hanger bubble wand. This might be another option for you. 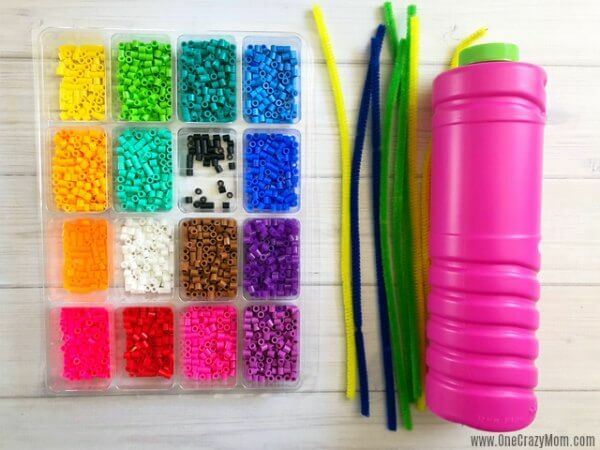 I also like to keep my perler beads in a craft container. It helps to be able to sort them by color and easily grab one. 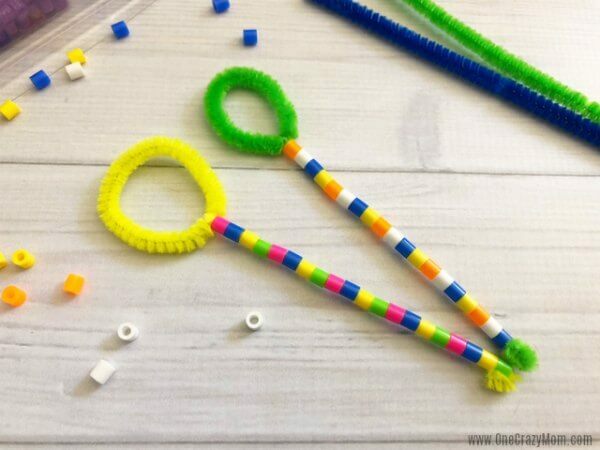 If you like these beads, learn how to make perler beads bracelets. This is such a fun craft. These little beads are lots of fun. You will love having this handy container to keep things organized. It’s worth the extra few dollars. Craft stores also have these for purchase. This bubble wand makes great bubbles! My kids loved making these and playing with them after. You definitely want to make your own bubble solution. Homemade bubbles are the best. It works great. I hope you enjoy this activity as much as our family did. Not only is it a blast to make but then you get to make bubbles! This activity is like two in one. Love this! You truly do not need to spend a bunch of money to have fun. Often the best memories are made when little money was spent. Time is precious and our little ones just want to be around us. Activities like this one are great for making memories, having fun and just playing together. 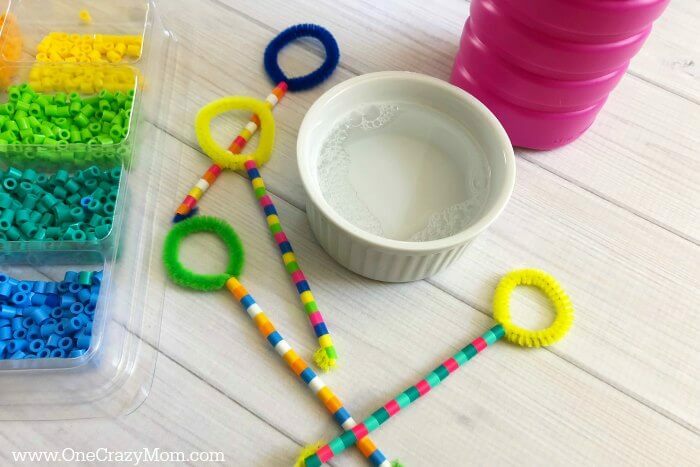 Plus, you can reuse these bubble wands over and over for more fun! I love diy projects that can be used more than one time. Come back and let us know how it turns out for you.